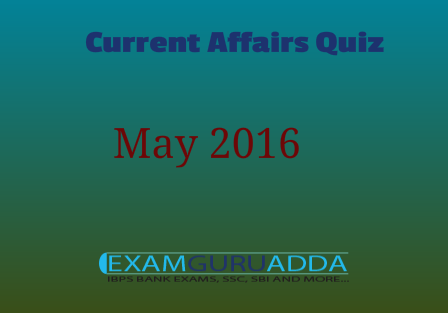 Dear Readers Examguruadda.in presents Current Affairs quiz of 19th May and 20th May 2016 that cover important current affair events. Current Affairs quiz prepared according to the latest Bank, SSC and other competitive exams. 1. Who was was sworn-in as the President of Taiwan? 2. Centre for Environmental Health to assess environmental impact on health launched at which place ? 3. Who has been awarded Distinguished Leadership in Teaching Excellence Award, University of Houston’s highest teaching award? 4. Apple Inc opens Development Office at which place ? 5. Diwaliben Bhil passes away recently. Who was she ? 6. How much loan amount has been sanctioned by World Bank for Indian solar programme? 7. The World’s first Scanning Helium Microscope (SHeM) has been built by which country? 8. The 2016 Women Economic Forum (WEF) has been hosted by which country? 9. The 27th series of CORPAT was conducted between the Indian Navy and.......? 10. Name the Indian Foreign Service (IFS) officer who was appointed as the Ambassador of India to Romania?